Are you sitting comfortably? 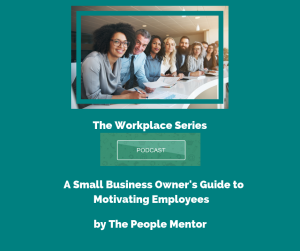 Welcome to my series of podcasts that will help you to navigate those inevitable difficult events at work that are part of being a small business owner, Manager and Leader. Today I want to talk about how to motivate employees. How do you motivate your employees? Many people believe that employees are motivated by pay and bonuses, and while pay is an important factor, it’s not the full story by far. Do you use fear as a motivator or are you on the opposite end of the scale, encouraging after work drinks in a bid to keep employees working hard for you? So ideally, any action you take to motivate your employee has to be taken with these in mind. So how can you motivate your employees? Coach employees, don’t direct them: When there’s a problem, instead of telling someone what to do, why don’t you have a discussion with them about possible solutions? This will help them feel more valued and confident in their own abilities. Give constructive feedback: Being overly critical or berating someone in front of others is one way to kill someone’s motivation. Instead, speak to them about what went wrong, or what is wrong and help them to learn from their mistakes. Helping someone to make plans for improvement is far more empowering than tearing strips off them. Recognise good work: Always reward good work. It can be anything from an email thanking them for a job well done, or a bottle or wine or some chocolates. A little positive reinforcement goes a long way. Take the good with the bad: Celebrate your wins, but also reflect on your losses. Everyone can learn from failure and it’s not something to be afraid of. If something is working really well, say so, and if it’s not going well, do the same. Be open and honest, and communicate with your employees; you’ll be rewarded in the long-run. Look after employee wellbeing: Employers who look after their employees’ wellbeing are rewarded with loyal, hardworking teams. It’s very motivating to know that your employer cares, and initiatives don’t have to be costly. Yes, you can opt to introduce health plans if you can afford it, but things like relaxation sessions, walking groups, and stress support can also be very effective options. Encourage employee development: Most employees want to be given the chance to grow and develop within their job role, and they’ll be more motivated (and skilled) if you provide them with training and other learning opportunities. Be flexible: Recognising the need for a work/life balance is important. While you might not be able to be as flexible as a large employer, showing employees that you respect the fact that they have a life and responsibilities outside of work is a great motivator. Allowing people to work flexibly (within reason) if they have children or caring responsibilities is one way that you can motivate employees and keep them working hard for you and your business. So as you can see, there’s more to motivation than just money. Would a generous salary still make up for a job where you were belittled, overworked, and unable to develop yourself? Human motivation is more complex than a paycheque. Maybe you yourself came to that realisation when you stopped selling your soul at a job you hated to become your own boss? The best tip I could ever give you is to be the boss that you would want. And if you do that, you won’t go far wrong.